Joanne Gerber is a Psychic Medium from the Boston Massachusetts area who is known for her natural ability to bring through evidential messages from those in the spirit world. Spirit communication validates the existence of another world, the spirit world, a place not separated by distance, but by dimension. The spirit world exists on a different vibration than our material world. It is helpful to think of it as a frequency, much like a radio has many different frequencies. As a psychic medium, Joanne demonstrates her abilities as a clairaudient, clairvoyant and clairsentient, attuning herself to this higher frequency, along with the effort of those in the spirit world, to allow the communication to take place. The communication process of psychic mediumship is a bridge between the two worlds that connects us with spirit loved ones, helping to bring closure, resolve and healing. Joanne radiates truth and integrity in all of her work, and is sincerely devoted to her work with spirit. Her intention is to help others on their spiritual journey through spiritual education and enlightenment. Joanne holds a Bachelor of Science degree in Business Administration and Marketing, is Reiki Certified, and is certified in both Clinical and Metaphysical Hypnotherapy, and holds a certificate of achievement signifying outstanding performance of mediumistic ability. In February 2007, after completing a nine step screening process, Joanne was welcomed as an Integrative Research Medium with The University of Arizona VERITAS research program directed by Dr. Gary Schwartz, PH.D. and Julie Beischel, PH.D. VERITAS is a scientific integrative research program dedicated to discovering the truth about the survival of consciousness and the continuity of life. 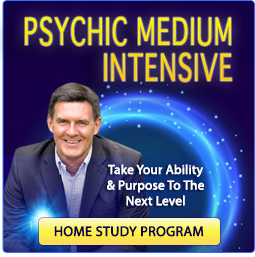 Many other noted psychic mediums have participated in the University of Arizona's mediumship research program including John Edward, from the hit television series "Crossing Over with John Edward." In March 2007, Joanne was awarded a Certificate of Mediumship Proficiency by The Forever Family Foundation, in recognition of Joanne's completion of the Medium Certification process and acknowledging achievement of Joanne's proficiency in her ability of Spirit Communication, through means that are neither deceptive nor fraudulent. 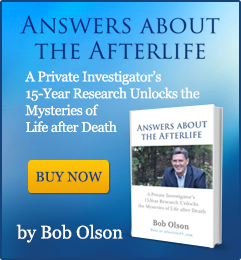 The Forever Family Foundation is a highly respected integrative not for profit organization that provides a forum where individuals and families who have suffered the loss of a loved one can turn for support, information and services, provided by ongoing research into the survival of consciousness and afterlife science. Joanne is a guest speaker at holistic health expos, spiritual centers and colleges, and is a frequently requested guest on many international, local and internet radio shows. Joanne has appeared on national television, including the NBC Weekend Today Show, and has been featured in many media articles, both in print and online. Joanne is also a featured psychic medium for The Boston Globe newspaper online edition, boston.com "Chat with Psychic Joanne Gerber". If you are looking for guidance about your life (relationships, career, etc..) then you are requesting a psychic reading. I will connect with you "energetically", by working with your aura, which contains information about you, your past, your present and your future. It is my spirit in my body connecting with your spirit in your body. You may receive guidance "psychically" that will help you to make some decisions in your life. My intention is to bring awareness where needed, and provide you with the best and highest guidance to help you move forward from current obstacles in your life. You will always have free will to make choices based upon what guidance you are receiving. Nothing is ever "set in stone". If you are looking to connect with someone who has passed, then you are requesting a mediumistic reading. I will raise my vibration, as those in the spirit world will lower their vibration on a frequency level to make the connection possible. It is my spirit in my body connecting with a spirit that no longer has a physical body. I will be connecting to those who have passed and who are able to connect with you at the time of the reading. 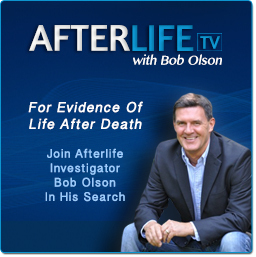 As an evidential psychic medium, I will ask those in the spirit world to communicate evidential facts that will validate the continuity of life after the physical world. Besides describing what the person may have looked like here on the earth plane, I will also sense their individual personality, and ask them for as many details as possible such as birthday and anniversary dates, dates of passing, names, and maybe what kind of work they did here on the earth plane, objects they owned or where they lived, etc.. Sometimes one person will be connecting at the time of the reading, and sometimes many people from spirit will connect with you during the reading. My intention as an evidential psychic medium is to work with those in the spirit world, asking for as much validation as possible so that it will leave no doubt in you mind that your loved one, or loved ones, have communicated with you from the spirit world. 1) When you contact me for a reading, I may ask you if you are looking to connect with someone who has passed. 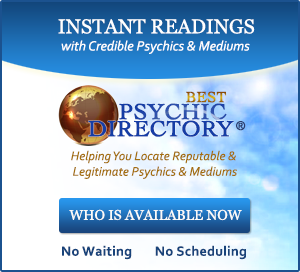 Because I work as a psychic and a psychic medium, I want to be able to know how I can best serve you. Please just answer yes or no, and do not volunteer any other information. I do not want to know anything about you or about the person/people in the spirit world that you want to connect with. 3) If you are looking to connect with one specific individual in the spirit world, I cannot guarantee that they will come through in a reading. As a psychic medium. I cannot "call people" to come and talk. To understand this better, think of the process of mediumship like two telephones. The telephone in the spirit world has a dial, and the telephone here in the physical world is only a receiver, without any dial. I can only receive the communication that the spirit world is willing to send at that given time. No psychic medium can make that guarantee, and be aware of those that say otherwise. 4) Please have patience during a reading. I know that you are eager to connect with your loved ones, but sometimes others from spirit will come through first, (even pets) before the person you are looking to communicate with. Allow those other spirits the time to connect with you as well. They may have a message for another family member or neighbor or coworker that can be very healing to the person you relay the message to. It is an effort for the spirit to communicate, and their effort needs to be acknowledged and respected. 6) Try to relax and put your mind at ease before a reading, and try to remain positive. Please discuss with me any concerns or apprehensions you may have prior to the reading. Please don't be afraid to ask questions, whether it be about the process, or about the information given during a reading. Try not to have any expectations. Have an open mind, and look forward to an enlightening experience.